A large 15" high skeleton with a "Gothic Architecture" theme to the frame. Rack striking, recoil escapement & maintaining power to the going fusee. This clock also fits the larger of the readily available "400 day" glass domes. 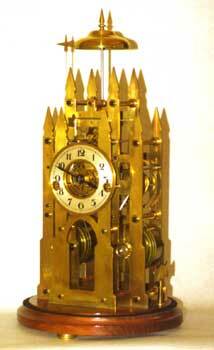 A lot of clock-not for the faint-hearted!